Today I bought a bag of conversation hearts, you know the ones with the little messages on them. When I had a few, and I must say that I forgot that in a odd way I really enjoy the taste of them. I had more and more as time went one. I enjoyed reading the sayings in order pretending that it made some type sentence, or at least something I knew what it meant. When I suppose I didn't notice that I was eating so many of them until, well I hit the bottom of the sack, and there was nothing else to be found. What can I say my stomach now hurts, and I must tell you that you can't read the little saying as they come back up. Although the colors, aww yes they are much neater when they are swirled together instead of just sitting next to each. I have come to find that placing this words together in a random way it honestly the truth. important to recognize something before you can realize it. I feel like I am always at the recognizing stage of this... I can't move past it... I notice the problem or the not so much of a problem, the anything, but I can't realize it. I am not at the stage that it begins to become something. It reminds me of when you recognize someone, but you still can't realize who they are. They are just that someone that is there, or someone that you just know you have seen before. Right now I recognize the things that I am going in, but I am not sure that I can realize that it is me growing in them. I can recognize that I am struggling with relationships, but I can't realize that I need to do something more with them. I can recognize that I need to give up my heart, but I can't realize that it is tomorrow. I took this photo before break, but it honestly never hit me until tonight when I thought about it.. and well I read it with a different view on it. Being overwhelmed because I don't have anything planned out finally got to me this week. I ended up putting all of my projects and exams on my calendar, and making more lists than any normal person knows what to do with. I suppose more than anything I am learning to deal with that is the way I have to be in order to function well for the most part. My schedules are now color coded-- the calendar of times on my desk, matches perfect to my calendar on the computer with the things that are due, my notebooks following that same path. I am a nerd, and I know it. Monday Lecture for AutoCad at 240 this may seem late, but it won't spot me from being up to catch the van to work at 815. At night I have my drawing class, which I must say after buying the supplies for it, I am now over the shock I had at first. Tuesday starts with English, which I am excited for the writings in there, and it seems to be an alright class overall. Even though this design class seems to be going to have a lot more than the ones last semester I think that it is going to be something that I learn a lot from, or makes me more aware of people in my designs. I am not looking forward to having physics 4 days a week, but I think that it will help me to complete the things I have to get done for it quicker, although I must admit I have to get the book in before I can even start that. My work study should be good this semester. I am excited to work with the much younger age of preschool. My commitment spiritually is CONNECTION just building up my relationships a lot more, and with more love and forgiveness. One thing I have to do is point out with people have hurt me but let them know that I forgive them for that. Back in the Sunshine, and warmth. I must say that my traveling is anyways an adventure, but that is alright with me. I am glad for a the chances that come from it. I am glad to be back, to what feels so normal that I am. I mean when I am going back and forth everything seems to be outta place, and nothing is just how it was, and the people are all so different. This time everything is just in the right place, and nothing seems different than it should. I must admit the train at seven in the morning was something I forgot about, and I am thankful I didn't have one back home. It isn't the most normal way of waking up. I have gained back a lot of what I thought I lost. Being away from certain things, as made it a lot easier for me to be myself, and not have to cover what I don't want them to take. I think that life as this way of providing an outlet that lets you go more than one way. Even if there only seems to be one way, that there truly is a different way. Most of the time I am blind to anyway but one. I am not interested in finding a different way, or making things work any way but the way I want and think that they should. I am thinking about looking for the other way all the time. No matter what the way I see is, I think that I should go the way that I don't always see, and make myself notice the other direction. Focus the things that I am not always willing or needing to see, but truly want to work at seeing. I am wondering how that will work. I mean that if I am going to go the way I don't always see, then how am I going to find that way, and will that become the way I start to see things in the first place, instead of how I normally would? This is the new year, and I don't feel any different. Maybe I have become numb to feeling, or maybe I have just become what them dang laramie kids were calling- emo. Yeah no not that last one. I have no resolution, I have a problem with easy solutions. I am going to just sit back and let life take me. I am letting it take me because no matter how hard I get slammed I won't feel it. I am not into feeling, I am sick of it. I am sick of feeling like someone is trying to become me, or sick of feeling like someone is meant to be mine. I can't organize the thoughts in my head... there is so much in there. I have no exceptions for when I get back, but isn't that the best because then I won't be crushed or hurt, not like I would feel it. It seems like my idealistic head is running, and wanting to get things, but I am not allowing it to. I hate that I do that to myself. It breaks me down, and takes me over. This was from a while ago, but I just wanted to post it cause I really like it. I guess I didn't think I would miss the snow when I finally picked Arizona, but I do now that I have been in it. I don't miss the negative temperatures, or the ice packed roads that you slide half way off of or into poles. This is at my ranch, between the barn and the house. It seems funny to think that I have a barn, sometimes I don't think of it seriously enough. How you could I am not sure. There is something I can't figure out when I am home. It isn't anything that is out of place, or different than anything before... maybe I am just noticing how much I am my own person. I am still the same person, I suppose I always was my own person, but I just can't stand not having someone there to watch over it and control it. I learned that once you are done making your own fun, more of the things that you used to do that were fun come back. I also learned that I have a lower voice than I thought I did. I heard myself talk when we were listening back to it. 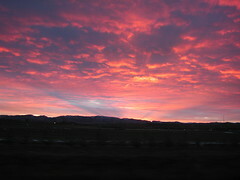 I can't really tell you what we got, because it was soo just WYOMING for you. I have made a point of pointing out when something is soo Wyoming for you, my mom is taking up the trend. It is interesting to see how it is soo rural, and yet soo many things are interconnected to somewhere else. In this town we don't have on National Bank chain, but many restaurants you can find somewhere else. This morning I went to McDonald's with the preschoolers. It was gross. It really made me wonder why people eat there, but it was funny to see the kids reaction to it. There was a ton of grease on the floor, and the kids where sliding all over it. I had to hold some of them up so that they didn't fall in that crap, cause I didn't want to clean them up. One boy turned to me once I had grabbed him right before he hit the ground and said, thanks if i fell in that I would be all gross. Then one of the girls turned to me and was like I think they should clean their floor better. Something about the fact that these four and five year olds knew that makes me scared to think that cleaning people don't. It was interesting to see how much the preschoolers reacted to everything. They wanted to go into the freezer, but since they weren't allowed they would stick their hands out till they felt how cold it was, and then be done with it. The all took turns spraying the dishwasher and ended up all wet from it. The funniest was to see how many different ways they would eat their pancakes. You wouldn't think that they would know how they like theirs or anything like that but each one knew exactly. Once we were back at the house, one of the little boys was calling me lazy for sleeping in during preschool yesterday. He is also the one that called me this morning to make sure I was coming. I suppose I was lazy, but I needed sleep just the same, and how would he know that that is lazy. Overall the mixture of snow, grease, and being told I was lazy, this morning was complete. 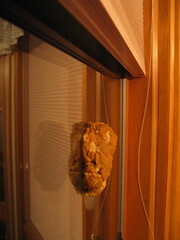 How many times do you throw a piece of pumpkin pie you have made into a ball on your window?!?!
" the darkest country road, the strong scent of evergreen, from the passenger seat you are driving me home." This is on the way to the ranch. I was uploading it, and these lyrics really seemed to fit, and it just happened to be the song playing. It really does seems like home, going to the ranch and watching stars. But I am ready to get back to Tempe. Today I spent the day in bed... after preschool... I really just slept a lot! Probably needed to after the all night of playing board games. I can give clues to Taboo like AWESOME like. It doesn't seem like I would be but my mind works in crazy ways. Tonight we got kicked out of the sketchy plains. That was interesting. Getting kicked out of a bar, because you brought in non-alcoholic drinks. I blame that place for more problems of the town now. 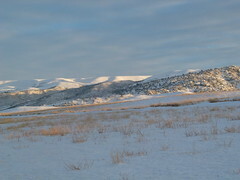 This is just a photo of some hills, from out at my ranch. It was really old out yesterday but I still managed to get some photos of the beauty. I woke up from a nap and my dad wanted to go out so we did. 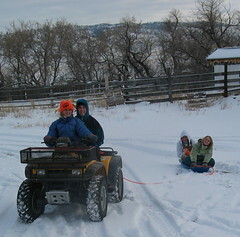 It was fun to go sledding, and drive the 4 wheelers again. I am a country girl at heart I suppose. I love to just get out in nature. So the funny thing about taking the photos I did was that they were all from the 4 wheelers, normally I would walk around and get good ones, but it was much to cold. yes yes it fell from the sky. I took the opportunity today to wear my snow-pants the majority of the day. I wore them when I went to the stores, and well just everywhere I went. I wore them around my house. I took a nap while wearing them, got a little warm so I opened up the little vent places at the knee. I ate dinner in them, and ooo look a little spot on them from where I spilled. I drank hot chocolate in them, that ended up on my shirt. I sat in them, and I looked cute! I knitted in them, wait I wore them like all day, so I did a lot in them. These snow-pants are amazing. I am going to wear them tomorrow to. I mean if it snows you should wear snow-pants, even if you aren't in the snow with them! I was sitting there at preschool today watching the snowfall and well I was thinking about how each snowflake is different. Then I looked at all them little kidlets during snack time, yes I was sitting at a mini table in a mini chair, and well I was thinking how different each kid was. No person is the same. I know these differences, I know how everything is different. I never thought that I was different than before. Different is what I always was. Now that difference is me and the snowflake next to me. I am nothing like those that fall with me, or pile up next to me. I, I got out. That wind it blew me away. The snow-pants I wear tomorrow FOR SURE! Well.. I've made the cut! Now I'll go buy some promise rings and knit myself a sweater. Someday EMO kids are going to rule the world! I am going to be one of them... but honestly I must just have become emo... maybe it is the fact that Wyoming is sad... or maybe it is because I want to rule the world. I can't deny the beauty of Wyoming. I haven't let my house today... I just took a shower about 30 minutes ago. so I totally never write about what I do a day because it seems like I do nothing. I am in Wyoming now, which really brings me to the point that I have nothing to do. I suppose I wrote little things like the cookies, and the grinch.... but yeah just nothing all the exciting ever seems to happen here. People sit at the truck stop for hours drinking coffee, and/or smoking. I must admit I have been out there, but I actually don't drink coffee.. and I can't smoke because my allergies have been so outrageous. I go just the same and sit there, and sit there. Sometimes I drink the free water, but mostly I sit there. 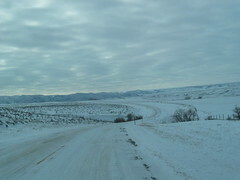 Other than that Wyoming has mostly offered me coldness. I have been freezing. I am not sure if it is the 10 degree weather or that fact that my mom doesn't like high heating bills, so we don't turn it up past 62 degrees. I am just so cold. I would love it if there was snow along with the cold, but that isn't the case. I haven't been able to go sledding or build a snowman family. This week possible, but honestly I think not enough will fall to cover the ground. I thought since it was a new year, I should do a little new look, and name of this blog. It is still going to be me, and my random thoughts, but I just wanted a new look, and name. I told about how 2004 was one of those years that is going to be hard to replace, but it seems that ringing in the new year is always a good start. what a joyful year you are going to find... you are going to be the ones figure you want to learn self control but are unable to do it. You are going to be the ones, that find failure and think it is fun to keep trying when you know that you will never have self control. Those that were passed out..
You are the ones that this new year will be the ones that focus on things that end late, but you are never able to make it to the end. The first ones to leave anything, even skipping out on those special things early. You are going to be the ones that are stuck in the place that you aren't. You are the ones that this year are wishing you could just go back, or forward. Alright so that is all CRAP... but I really do wonder if that would tell you a clue into your year... It is something you would never think would be thought about. I can tell you that I saw a lot of different ways of Celebrating that minute last night. It seems like everyone had their own way, but it came back to the fact that the New year is a reason to celebrate life... it is just another year to add one. We are awesome at this game! SOOO many cookies! Such good times!